Motlow State and Tennessee State University are partnering to provide a four-year degree in agriculture. The goal is to bring college courses to people who might otherwise be unable to earn a degree to advance their careers and farming opportunities. 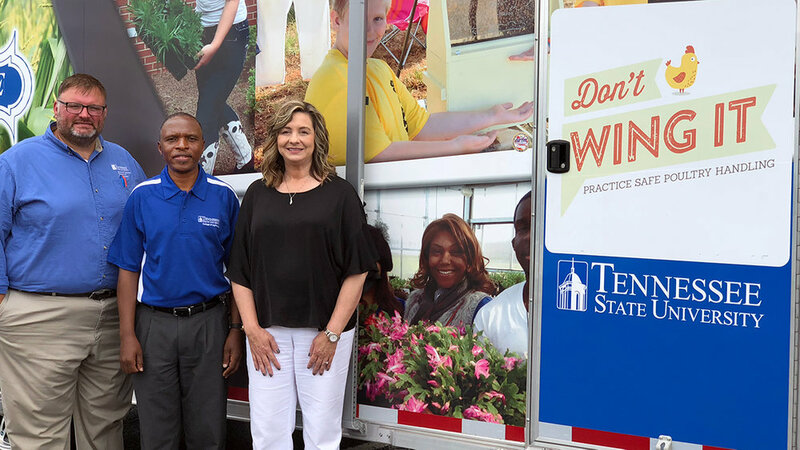 Pictured above are TSU Ag professor Dr. John Ricketts (left), TSU Ag chair Dr. Samuel Nahashon, and Lisa Smith, assistant dean Motlow Fayetteville Campus, outside TSU’s mobile agriscience lab. Tennessee's rural communities have a new pathway to higher education. This fall, Motlow State Community College will be offering associate of science degrees in agricultural business and animal science at the Fayetteville campus. The new degrees are part of the Tennessee Transfer Pathway program allowing students to earn an associate degree at Motlow while being assured that the credits will transfer to a bachelor’s degree program at state universities in Tennessee. Motlow is partnering with Tennessee State University (TSU) to offer a “2+2” degree program at the Fayetteville campus. The “2+2” program will enable participants to earn an associate degree at Motlow, then have the opportunity of earning a bachelor’s degree in agricultural sciences from Tennessee State University, which can be conveniently completed at the Motlow Fayetteville campus. Dr. John Ricketts, professor of agricultural science at TSU, said it could be a game changer for the rural community. "Forty to 60 percent of jobs in the agricultural industry go unfilled, or filled by folks that don't have any training in it,” Ricketts said. “So, it's not good for the industry, it's not good for the economy, and so there's a high demand for students with this Ag Science degree." So far, at least 20 people have expressed interest in the program. They will receive some distance learning, as well as in-person instruction from TSU professors. Financial aid opportunities at Motlow include the Tennessee Promise for eligible high school graduates and Tennessee Reconnect for eligible adults. Scholarships are also available through TSU, including academic scholarships, internships, and scholarships for any former Future Farmers of America or 4-H member. Ricketts said the knowledge students will receive is much-needed in the state's agriculture industries. "We'll give these students in the Fayetteville area the same opportunities that we have here in Nashville, in terms of hands-on learning and being mentored by research scientists,” Ricketts said. “So, we kind of look at it as a total program in terms of, you'll get some lecture, but there's also hands-on, experiential learning that takes place." Motlow State Community College and Tennessee State University are currently accepting applications into the programs for the fall 2018 semester.